The inspirational story of Eddie ‘the Eagle’ Edwards prompted the production of a feature-length film. Though some of the film was fictionalised to maximise drama, the story of Eddie Edwards remains a remarkable one. We take a look at what made Eddie one of the greatest showmen in the world and the poster boy for dreamers everywhere. 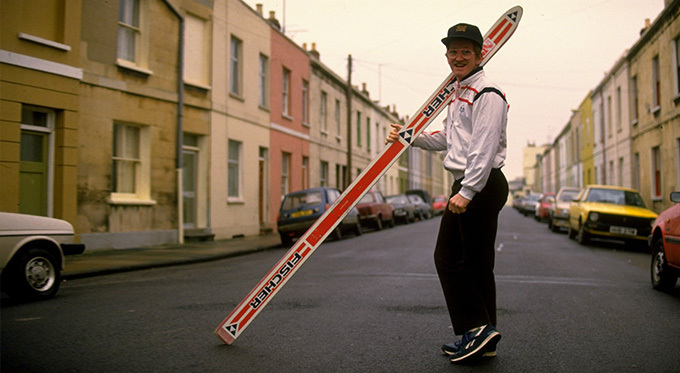 Eddie was a gifted downhill skier and despite his best efforts, he failed to make the Great British team. While many would have turned to a different vocation at this time, albeit with a heavy heart, Eddie decided that this was just the start. And he embarked on one of the most exciting journeys in British athletics history. He looked for any way to continue his Olympic dream and found it in the sport of ski jumping. Realising that no other British skiers competed in this area, Eddie had found himself a way in. But this was only the beginning, as a number of hurdles were in place to stop amateurs competing at the Olympics . But with significant skiing experience, Eddie was no amateur and took well to ski jumping. 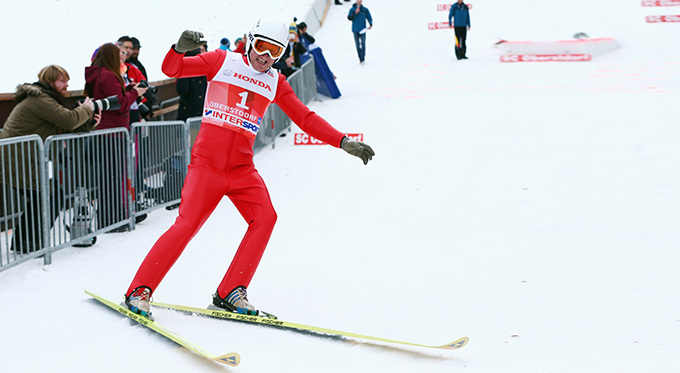 Even though he was not the masterful skier that his rivals were – due in part to the age he took it up, he still broke the British world record and continued to improve his personal bests. By the winter of 1987, while working as a plasterer and living in a Finnish mental hospital, just to save money – Eddie got the call he had been waiting for. He was able to represent Great Britain at the 1987 World Championships in Bavaria. This was an unbelievable feat for a man who was funding his own dream. His performance at the World Championships was good enough to qualify Eddie for the Winter Olympics the following year. It was Eddie’s appearance at the Winter Olympics in Calgary in 1988 that changed the face of athletics forever. Normally known for its complete dedication to peak performance, the Olympic Games were about to receive a stark reminder of what sport truly means to the world. When Eddie stepped out to compete in the prestigious games, he was under the microscope already – with many deciding he was not good enough to compete. But what Eddie lacked in top-level talent, he made up for in determination. Though a gifted skier, the standard of the athletes Eddie was up against in Calgary made it no easy task. As expected, he was off the pace when he pitted himself against the best in the world. For some, this would have been embarrassing, for some, humiliating. But for Eddie – it was exciting, fascinating – a dream come true. And there was a huge shift in perspective as viewers all over the world fell in love with the captivating personality of Eddie Edwards. Though he was far from the most talented skier in attendance (especially in terms of jumping), he proved a popular presence due to his incredible commitment and showmanship. The crowd began to cheer for Eddie as he stood at the top of the ski jump, prepared for the biggest jump of his life. Eddie and the world took a collective deep breath as he stood atop the 90m slope hoping to wow the world. But he would have to land this jump. He did, and in doing so he earned himself another personal best and a British record. Pumping his fists with a beaming smile on his face, the crowd began to cheer louder, prompting Eddie to flap his arms up and down, impersonating an Eagle. A Legacy: What Happened to Eddie the Eagle? Eddie became the face of the games and an Olympic icon for his down-to-earth personality. His attitude brought the world to their feet, celebrating Eddie’s achievements with him. The International Olympic Committee didn’t look so fondly upon Eddie’s perceived achievements and brought in the Eddie the Eagle Rule in 1990 to stop future amateurs from reaching the biggest stage. It required hopefuls to be placed in the top 50 of the world’s competitors or be ranked in the top 30% to compete in international standard events. But Eddie’s legacy was already confirmed. Utterly loved all across the world, Eddie was quickly picked to appear in a host of adverts and television shows. In the 2000’s Eddie was finally accepted as an ambassador for the Winter Olympics , first participating in the festivities ahead of the 2010 Vancouver Olympics and becoming the torchbearer in the relay for the Games. 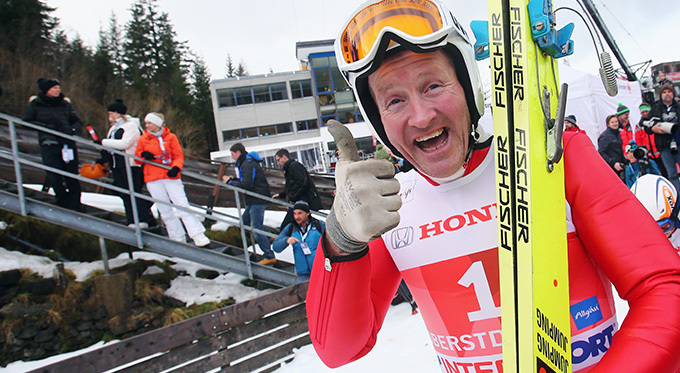 The 2016 film, Eddie the Eagle saw an all-star cast chronicle the story of his fascinating career. Today, Eddie Edwards is a wonderful Olympic Speaker and motivational speaker, able to engage guests with stories of his inspiring rise. Speaking on themes such as ski jumping, sporting success, publicity, personal endurance and resilience – the greatest underdog story in the history of athletics is an amazing one to hear and can motivate any team. 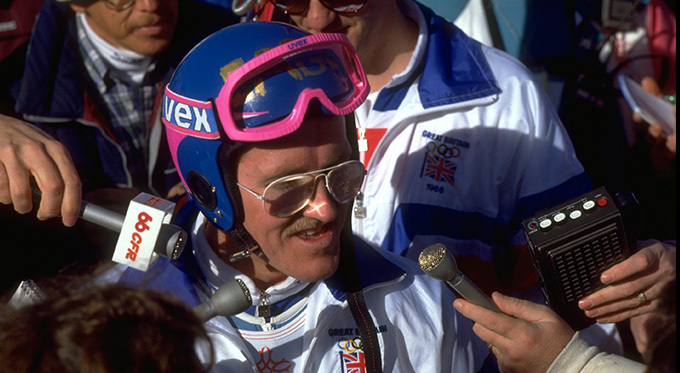 Book Eddie the Eagle Edwards for your gala dinner, award ceremony, product launch or other corporate events for an extraordinary inspirational speech encapsulating the trials and tribulations of the great Olympian. Simply contact us by filling in our online contact form or by calling a booking agent directly on 01509 85 29 27.